This entry was posted in Books, Business / Leadership and tagged Books, corporate-culture, customer-experience, Photos, starbucks by Ron Bieber. Bookmark the permalink. Thanks for the tip – I was wondering how to get my hands on one – I to read that book, and am about to start my own service business, and Starbucks has it down. I’m a bit confused! I finished reading the book and have been to 3 Starbucks store and asked for a copy of the green apron book…none of them neew what I was talking about. I called their 800# for CS and was told that I coudn’t have a copy. It is for internal use only! This supports the theory that there must be a mirror universe somewhere. After reading the same book last week, I went into my local starbucks in SINGAPORE, and they gladly gave me a copy of their green apron book. Hello, is it possible that you share a copy of it? I have finished the starbucks experience last week, and thought wanna get the green book , later gotta try asking my nearest starbucks. but do you think that culture also set the starbucks experience ? I mean that does starbucks in US, Singapore, thailans , Indonesia will give the same experience ? or some country will give better experience than the other ? I also went into a starbucks store and they told me it was for employees only and that there is a copyright on it and employees have to sign a agreement to not use it for personal use or they will be sued by the corporation. Tell me how to get one!! I really don’t know what to tell you guys. I just walked in, asked for it, and it was handed to me – no questions asked. Its interesting to see the different reactions from Starbucks employees around the world. What is contained in the Green Apron Book isn’t necessarily plans to a nuclear bomb. Its common sense stuff. I have a hard time imagining why there would be resistance to sharing it with customers, especially given my experience. Keep the comments coming in though! Hi Ron, I am from India and hence don’t have an access to a Starbucks outlet. (Though they are making entry plans). How can I access a copy – any plac eon the net where I can download one ? Hey, if anyone’s still reading this and wanting to know more about the Green Apron Book, just email me at entropy217-at-gmail.com (obviously replace “-at” with “@”). I have one and will email you the details contained within. Also, I just checked ebay and found one. * If you are not given one by a Starbucks Barista, try asking earlier or later in the day – different shifts may be more relaxed about it than others. * Just try another Starbucks! They’re freakin’ everywhere. There shouldn’t be any rules about giving it out; it’s just up to the manager. Hi. I worked for Starbucks and helped develop the Green Apron book. It is really intended to be an internal tool for baristas and other partners to understand the language and *how* to deliver the Starbucks Experience. The book is a very cool tool and partners are proud of it. As was mentioned here… It’s not only a work guide… but a way to live as well… With tips such as “Be Welcoming” “Be Knowledgeable” “Be Authentic”… you can see the wide application. Starbucks hasn’t printed enough to provide them for customers as well – so they’re not made for general distribution. 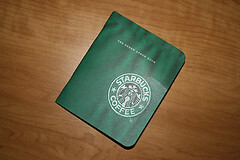 Yes, you are provided with a single copy to use as a personal guide when you begin work at Starbucks. No, partners don’t sign an agreement stating that they’ll be sued if they give it away! The book “The Starbucks Experience: 5 Principles for Turning Ordinary Into Extraordinary” tells you everything that is in the Green Apron Book and more. Don’t use eBay… that’s stolen property you’re bidding on. Not cool. Anyone knows if I could get a copy in Malaysia (if I ask nicely)? If you just read my last post and are thinking about asking me for a Green Apron Book, you may have to forgive my hard drive for crashing and destroying what I had of it in digital form. I have been getting about two or three people per month asking me for it, but it took me a while to get around to finding out where in the world wide web I posted a comment saying I had it. Dear synical, I’m a Starbucks partner from Malaysia and to be honest, our store itself dont have enough copies to provide to our other partners. Therefore, we’re unable to provide you one. However, there’s such thing as 5 Behaviour cards that we can show you and let you read it. =) Hope it helps. We are also short on supplies. No love here. Dear MCHLLE, how is it possible that you do not provide enough copies to your other partners? i though the book was suppose to outline the principles of Starbucks. If your partners and employees do not have access to the material, how are they suppose to deliver the starbuck experience? I currently live in Indonesia and I love Starbucks, I loves their values and their spirit, somehow this brand has succeeded to deliver their core identity to their customer, however NOT all of Starbucks store able to deliver the Starbucks experience to their customer, when I was in Russia the only Starbucks I could find was in Moscow the baristas was terrible, they don’t even know what I want, and they don’t even try to offer me coffee of the day (plus they don’t speak English), and in Indonesia it self some of Starbucks store are just lovable, most of them are just the ORDINARY Coffee shop”..I think this green apron book should be able to standardized the Customer Service of Starbucks around the globe BUT in fact it’s not working that way”…so reading the book of Starbucks Experience makes brand Starbucks overrated! !because NOT all the description about the passion, the barista, the way they try to delighting customer are correspond with the real Starbucks Store now-day!! So they mailed me both a copy of the Green Apron Book as well as a Coffee passport – woo hoo. I come from China. There are at least 7 Starbucks in my city, but it is impossible to get a copy from the barista or other partners. Starbucks is a ordinary origanal coffie shop i love starbucks with a smile it was just how i though it would of bean i could see my sealf in a green apron.